Climate change-induced sea level rise is causing trillions of dollars of damage to the coral reefs across the small island nations. A United Nations report has estimated that the sea-level rise in the 52 small island nations is up to four times higher the global average, putting the environment and socio-economic development in these nations at a greater risk. The United Nation’s Environment Programme’s (UNEP’s) Small Island Developing States Foresight Report, released on June 5, estimates that the 52 island nations, home to over 62 million people, emit less than one per cent of global greenhouse gases, yet they suffer disproportionately from climate change. For instance, coral reefs, the frontline for adaptation, are already severely impacted by rising sea surface temperatures along these nations. The global net loss of the coral reef cover—around 34 million hectares over two decades—will cost the international economy an estimated US $11.9 trillion, with Small Island Developing States especially impacted by the loss. 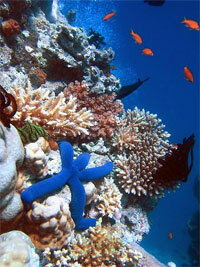 It is estimated that each hectare (2.5 acres) of the world's coral reefs provided services worth US $350,000 a year. In the Caribbean, for example, up to 100 per cent of coral reefs in some areas have been affected by bleaching due to thermal stress linked to global warming. Climate threats are projected to push the proportion of reefs at risk in the Caribbean to 90 per cent by 2030 and up to 100 per cent by 2050. The report warns that the magnitude and frequency of climate-related hazards will increase in small islands. “This will lead to disproportionate and compounded climate change impacts, which will adversely affect multiple sectors—from tourism, agriculture and fisheries to energy, freshwater, health and infrastructure, unless ocean-based green economy approaches and policy options are put into action,” said the UNEP report. However, the report also suggests that small island nations can transition to an inclusive green economy and ensure a sustainable prosperous future by taking advantage of opportunities in areas such as renewable energy and sustainable exploration of unexploited resources. It recommended that these countries should develop an ocean-based green economy and lead the world in the development of inclusive indicators that go beyond Gross Domestic Product to include natural resources. Islands constitute less than five percent of worldÃ”Ã‡Ã–s land area. The islands are influenced by several weather and non-weather factors. One such factor is sea level change. There are several factors both climate-related and human-induced factors that contribute to sea level changes. Thus in some zones sea level shows rising; some other zones shows fall; and in majority of the zones there is no change. For example some parts of US East Coast show a rise and West Coast a fall. They are in general following natural cycles and general circulation patterns of a given region. World Environment Day is celebrated on 5 June as declared by the UN General Assembly in 1972. The World Environment Day was established to mark the opening of the Stockholm Conference on the Human Environment. United Nations designed World Environment Day (WED) as the main tool to create worldwide awareness about hot environment issues. Over the years it has grown to be a broad, global platform for public outreach that is widely celebrated by stakeholders in over 100 countries. It also serves as the Ã”Ã‡Ã¿peopleÃ”Ã‡Ã–s dayÃ”Ã‡Ã– for doing something positive for the environment, galvanizing individual actions into a collective power that generates an exponential positive impact on the planet. The 2014 theme for World Environment Day will focus on 'Small Islands and Climate Change', the official slogan for the year 2014 is 'Raise Your Voice Not The Sea LevelÃ”Ã‡Ã–. EarthÃ”Ã‡Ã–s climate is dynamic and always changing through the natural cycle. What we are experiencing now is part of this system. Also, general circulation patterns over different parts of the globe are part of this system. However, with the unabated population growth to meet their needs under new lifestyles based technological innovations local and regional environments are modified and thus they influence the natural cycle in climate at local and regional scales represented by trend. WMO (1966) presented a manual on Ã”Ã‡Â£Climate ChangeÃ”Ã‡Ã˜ wherein it discussed methods to separate natural inbuilt variations from man induced trend. That means climate change has inbuilt natural variations consisting of rhythmic variation in which irregular variations associated with intra-seasonal and intra-annual variations are part. The other part, namely human-induced variations represented by trend (increasing or decreasing) consisting of land use and land cover changes, known as ecological changes wherein urban-heat-island and rural-cold-island effects are part; and temperature increase due to increased levels of anthropogenic greenhouse gases, known as global warming. Thus, global warming is only one component of climate change. Global warming is represented by trend in temperature; and climate change is represented both by trend and natural rhythm in which extremes form part in temperature and precipitation. IPCC states that Ã”Ã‡Â£Human influence has been detected in warming of the atmosphere and the ocean, in changes in the global water cycle, in reductions in snow and ice, in global mean sea level rise, and in changes in some climate extremes. It is extremely likely that more than half of the observed increase in global average surface temperature from 1951 to 2010 was caused by global warmingÃ”Ã‡Ã˜. Ã”Ã‡Ã³	Also, the seasonal and annual variations in temperature are far far higher than this change. Global warming is in fact a brain-child to counter the environmental Movement against pollution, more particularly agriculture pollution, initiated in late 60s and early 70s. Now, all ills of the society are attributed to this word as there are billions of US$ to share under the disguise of research and carbon credit schemes. Theory predicts that increasing global warming causes increasing loss of sea ice. Ice is confined to outside the South Polar Ring and inside the North Polar Ring. That means South Polar ice melt is the true reflection of global warming impact on ice melt. At present it is not showing any melt in the Southern Polar zones. The Southern Polar zones are on the contrary building ice. If we look at the data of seasonal variation of sea ice year by year at Arctic (North Pole) and Antarctic (South Pole) in the last decade, they are above the average line at Antarctica and below the average line at Arctic Ã”Ã‡Ã´ the extent of spread of AntarcticaÃ”Ã‡Ã–s ice is several times larger than Arctic ice spread. They fall within the long term standard deviation limit around the long term average except 2012 Arctic seasonal pattern that falls below the standard deviation shade. In statistical terms even up to twice the standard deviation the extremes occur. This suggests less ice melt on an average and thus negative contribution to sea-level rise. The Arctic ice melt present an opposite pattern to Antarctica ice melt. Ice is affected by too many compounding factors. They also are influenced by natural-cycles in climate change that are part of general circulation, like Southern Oscillation (ENSO), AMO, PMO, 50-70 year, etc. The three coldest Arctic summers have all occurred in the last 5 years (2009, 2010 & 2013) since 1958. From 1980 Ã”Ã‡Ã´ 2000, both AMO & PDO show warm phases, and so the Arctic melt was likely caused by the Warmer surface sea water. After 2009 December Copenhagen fiasco, IPCC admits glacier goof-up and says the Himalayan Glaciers won't melt by 2035 and withdrawn this conclusion. Similar way, Al Gore withdrew his claim that Greenland will become ice free in 5 years. Recently an article appeared saying that Ã”Ã‡Â£Smoke from religious site melting Himalayan GlaciersÃ”Ã‡Ã˜. Also, there is an increased human physical activity in these zones Ã”Ã‡Ã´ sporting, pilgrimage, deforestation with increased population growth, infrastructure development, mountaineering, etc, In the Arctic and Antarctica zones in addition there are several other activities like drilling for gas and oil and Earthquake and Volcanic activities affect the ice melting or ice destruction. So, ice melt is associated with weather related factors and non-weather related factors. Sea level like weather varies considerably from year to year for island nations. Currently there are about 30,000,000 cubic kilometers of ice in the worldÃ”Ã‡Ã–s ice caps and glaciers; of this 76.8% is in East Antarctica Ice Sheet, 10.0% in West Antarctica Ice Sheet, and 9.8% in Greenland Ice caps; of which 97.9% is grounded ice and 2.1% floating ice. For comparison, globally ice (both grounded and floating) represents about 2.0% of the worldÃ”Ã‡Ã–s water. To melt the Greenland and Antarctica would take thousands of years under any realistic change in climate. We must also remember one thing that the global temperature rise component of Southern Hemisphere is less than that of Northern Hemisphere. The Antarctica ice cap appears to currently be growing rather than shrinking. We are well aware of Hydrological cycle, the evaporated water from Oceans that occupies two-thirds of the globe, and from water bodies on land comes back as rain and snow. Reports suggest that each year about 8 mm of water from the entire surface of the Oceans goes into the Antarctica and Greenland ice sheets as snowfall. If no ice returned to the Oceans, sea level would drop by 80 mm every 10 years. Scientists donÃ”Ã‡Ã–t know which is greater, the ice going in or the ice coming out. On the timescale of years and decades, sea level records contain a considerable amount of variability. For example, approximately a 10 mm rise and fall of global mean sea level accompanied the 1997Ã”Ã‡Ã´1998 El Nino Ã”Ã‡Ã´ Southern Oscillation (ENSO) event, and a temporary 5 mm fall accompanied the 2010Ã”Ã‡Ã´2011 events. Inter-annual or longer variability is a major reason why no long-term acceleration of sea level has been identified using 20th century data alone. Tide gauges in the United States reveal considerable variation because some land areas are rising and some are sinking. For example, over the past 100 years, the rate of sea level rise varied from about an increase of 0.36 inches (9.1 mm) per year along the Louisiana Coast (due to land sinking), to a drop of a few inches per decade in parts of Alaska (due to post-glacial rebound). The rate of sea level rise increased during the 1993Ã”Ã‡Ã´2003 period compared with the longer-term average (1961Ã”Ã‡Ã´2003), although it is unclear whether the faster rate reflected a short-term variation or an increase in the long-term trend. Alaska shows a large fall in sea level. Along the USA coastlines, a large part showed a 0 to 1.0 feet fall. A report observed Ã”Ã‡Â£Sea levels rising fast on US East Coast Ã”Ã‡Ã´Not clear whether human caused global warming is to blameÃ”Ã‡Ã˜. That means parts of East Coast show rise and West Coast show fall. That means there is something else influencing sea level rise. Some of these may be due to sinking of land due to oil-gas-water extraction from the Earth; ocean floor changes; volcanic/earthquake activities, etc. In fact in Greenland area new islands appears and old islands disappear. Because of such scenario: Ã”Ã‡Â£One study showed no acceleration in sea level rise in US tide gauge records during the 20th century. However, another study found that the rate of rise for the US Atlantic coast during the 20th century was far higher than during the previous two thousand yearsÃ”Ã‡Ã˜. Sea level studies must be made by taking in to all issues affecting at local or regional level. It is not good to look at global average scenario. This leads us nowhere. Many media reports have focused on the island nations of the Pacific, notably the Polynesian islands of Tuvalu, which based on more severe flooding events in recent years, were thought to be "sinking" due to sea level rise. A scientific review in 2000 reported that based on University of Hawaii gauge data, Tuvalu had experienced a negligible increase in sea level of 0.07 mm a year over the past two decades, and that ENSO had been a larger factor in Tuvalu's higher tides in recent years. A subsequent study by John Hunter from the University of Tasmania, however, adjusted for ENSO effects and the movement of the gauge (which was thought to be sinking). Hunter concluded that Tuvalu had been experiencing sea-level rise of about 1.2 mm per year. The recent more frequent flooding in Tuvalu may also be due to an erosion loss of land during and following the actions of 1997 cyclones Gavin, Hina, and Keli. Vincet Grey observed that Ã”Ã‡Â£We are told sea level is rising and will soon swap all of our cities. Everybody knows that the Pacific island of Tuvalu is sinking---. Around 1990 it became obvious the local tide gauge did not agree --- there was no evidence of sinking. So scientists at Flinders University, Adelaide, set up new modern tide-gauges in 12 Pacific islands. Recently, the whole project was abandoned as there was no sign of change in sea level at any of the 12 stations for the past 16 yearsÃ”Ã‡Ã˜. An article Ã”Ã‡Â£Indian ocean Sea Level change in warming climateÃ”Ã‡Ã˜ in Nature Geosciences (July 2010) observed Ã”Ã‡Â£While a number of areas in the Indian ocean region are experiencing sea level rise, sea level is lowering in other areas. The study indicates that the Seychelles Islands and Islands of ZanzibarÃ”Ã‡Ã–s coast show the largest sea level drop. Islands house a disproportionate amount of the worldÃ”Ã‡Ã–s biodiversity. Although it has less than five percent of worlds land area, yet it is a habitat for over 20% of the planetÃ”Ã‡Ã–s terrestrial biodiversity. IPCC assessments suggest that deltas and small island states are particularly vulnerable to sea level rise caused by both thermal expansion and ocean volume. Sea level changes have not yet been conclusively proven to have directly resulted in environmental, humanitarian, or economic losses to small island states, but the IPCC and other bodies have found this a serious risk scenario in coming decades. Sea level like weather varies considerably from year to year for island nations. A combination of many factors including wind, ocean currents, ocean temperature and periodic ocean oscillations bring about annual variations. While long term threat to these islands is inundation, the more immediate and pressing problems are those associated with storm surges, flooding, coastal erosion, saltwater incursion in to fresh water supplies. A recent report states that Ã”Ã‡Â£sea level rise forces US space agency to retreatÃ”Ã‡Ã˜. It observed that many NASA Centers have already, faced costly damage from encroaching water, coastal erosion and potent hurricanes. In association with local conditions and natural disasters the sea levels show rise in some places, fall in some places, and no change in the majority of places. Ã”Ã‡Ã³	Down To Earth Magazine presented an important article Ã”Ã‡Â£Vanishing islandsÃ”Ã‡Ã˜ Ã”Ã‡Ã´ Bangladesh Coast. It observed that frequent natural disasters continue to inundate and erode many islands in the 'climate impact hot spot'. Ã”Ã‡Ã³	So, there are several other localized weather and non-weather components creating a situation of sea level rise. In addition localized natural variations do influence sea level. Global warming is negligible at present and by 2100 it is not going to change much. Thus its impact on ocean ice melt and thus sea level rise is insignificant. However, the rhythmic variations Ã”Ã‡Ã´ 60 year cycle Ã”Ã‡Ã´ present a systematic change in ocean ice melt & build up with the time and thus sea level change Ã”Ã‡Ã´ rise and fall. They are part of general circulation patterns over different parts of the globe. Worldwide small islands in oceans are innumerable. Some of them are eroded with the passing of time due to weather and non-weather factors. But, some of the inhabited island rulers like Maldives are playing money game.